Who is ready for the Christmas recipes to start? I know it is a little early to start talking about Christmas, but it’s never too early to start looking for healthier Christmas treats. I am ALL for indulging at Christmas time and you can bet that there will be a Terry’s Chocolate Orange for breakfast at some point over the festive season, but for the most part I will be eating healthier alternatives wherever I can. The key for me though, it making sure that they are just as delicious. 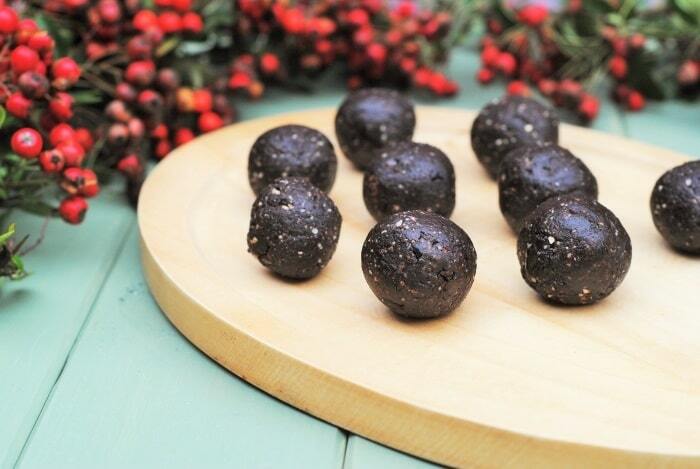 This recipe makes 40 truffles, so it’s a great recipe to serve up at a Christmas party, or give as gifts. But you can easily half or quarter the recipe to make less. This recipe is adapted from my Brownie Bites recipe, that when it has a little bit of moisture added, it tastes more like a truffle than it does a brownie. 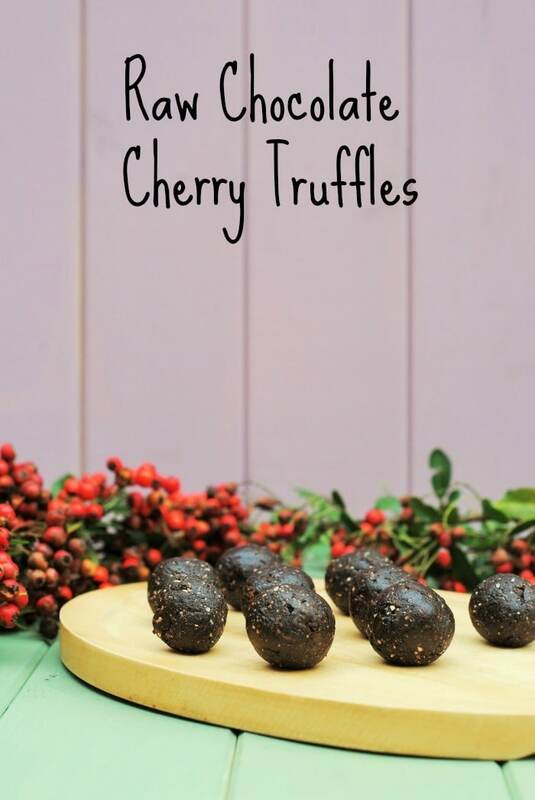 I had the most amazing chocolate cherry truffles last Christmas, so I just knew that I wanted these to have some cherries in them, as it’s such a good flavour combination. You can look forward to a LOT more snack recipes on the blog in the new year. 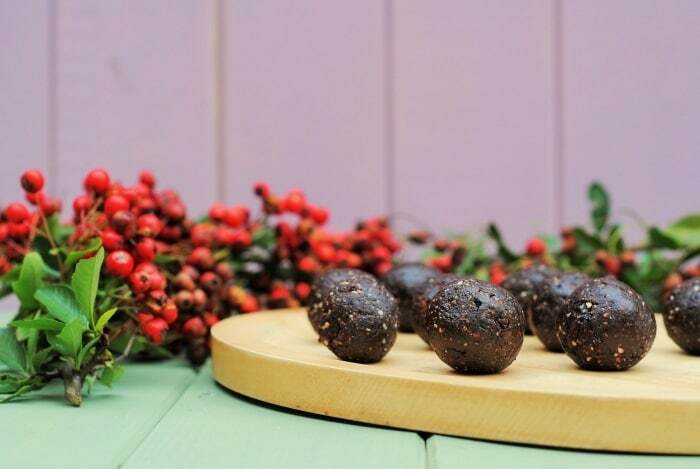 I would put them up before then, but the blog is going to be packed full of healthier Christmas recipes for the next few weeks, although some snacks are in included in that. If I have learnt anything from my recent Weight Watchers challenge (and I have learnt a lot), it is that I am a snacker. I am pretty good at tracking my meals, but the odd snack here and there I didn’t used to track, as it wasn’t a full meal. But let me tell you, all those snacks add up! After taking the Weight Watchers Brain Boost Quiz, which I have spoken about in more detail in my Vanilla Chia Oats with Maple Pears and Kale and Harissa Pizza recipes, I realised that I am a naughty but nice eater and my impulse to indulge is often stronger than my willpower. Whilst my willpower is something that I can work on, in the mean time I need to make sure that I have healthier snacks on hand for when those impulses present themselves, which is how this recipe came about. Assess the reasoning behind your urge to snack. Do you want to eat just because the food is there all around you? New science reveals that today’s overloaded food environment is one of the most important reasons we tend to over-eat: it’s not all about lack of willpower! Alternatively, have you eaten less during the day to increase your appetite or have you been very active? Choose the right snack that are low in points. Snacks can be easily forgotten so track what you eat as soon as possible. I did a little experiment in the first week and I didn’t change anything in my diet or exercise routine apart from the fact that I started tracking my snacks too and you know what, I lost 4lbs that week. 4lbs from just tracking my snacks! My snacks are healthy, like nuts and seeds, or these truffles, but it doesn’t matter how healthy something is if you are overeating it. That is what I love most about Weight Watchers, nothing is off limits, but it really teaches you about portion control and tracking what and how much you are eating. 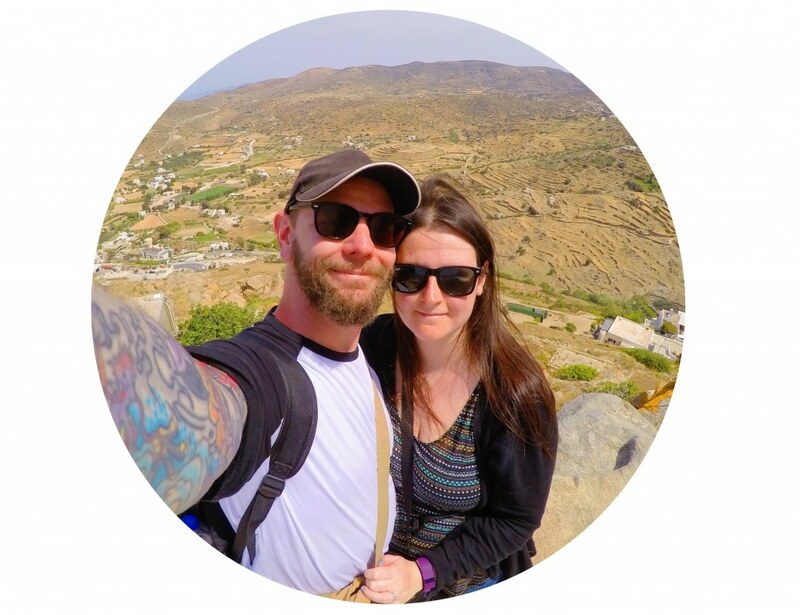 With the new Brain Boost feature of Weight Watchers, you can see what type of eater you are too and pick up some top tips on how you can work round that and be the healthiest, happiest you! 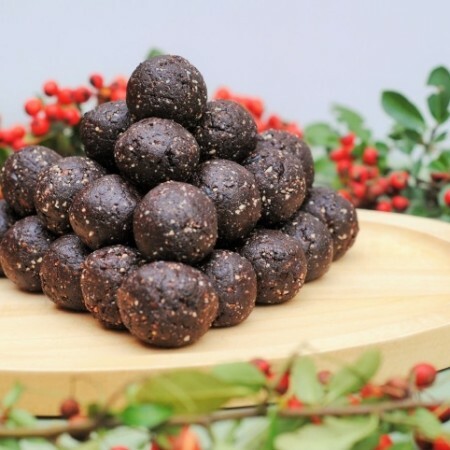 These vegan chocolate cherry truffles fit right in to that and you know what, they make a really nice Christmas gift too if you are looking to save some pennies and make some homemade gifts. 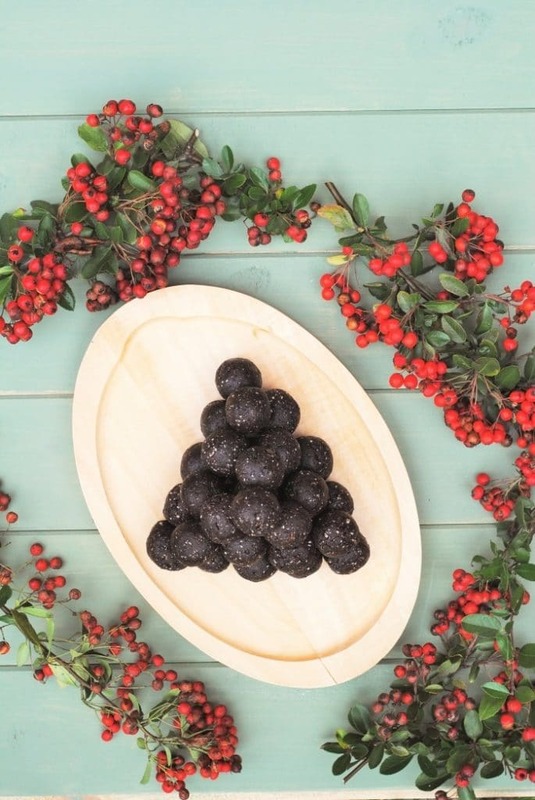 By using dried fruit rather than regular sugar, you get the added fibre and the nuts give the creaminess you get in truffles without having to use cream. 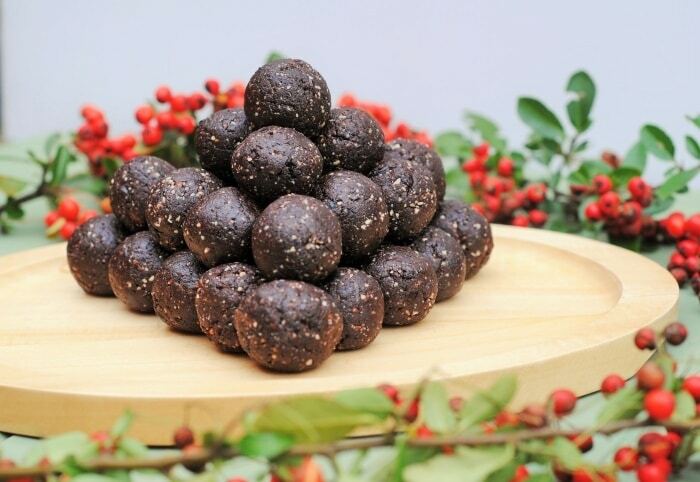 Love these healthy truffles, I keep meaning to make something like this but still on the to do list! They look so healthy n delish. 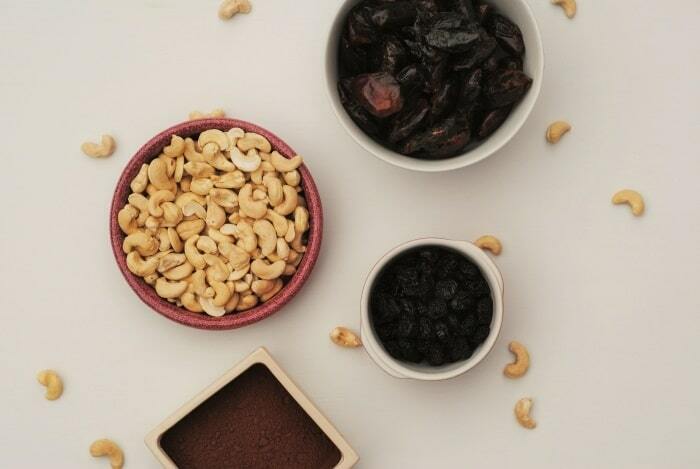 I love the combination of dates with cashews n with cocoa powder n cherries added, this would be divine! These look delicious! The flavors sound like they will be so good together. Thanks for sharing. i love the combination of cherry and chocolate together..so totally could see this happening!